Wits Sports Administration held its annual bursary awards, aimed at encouraging outstanding achievement in sports, on 7 March 2013 at Sturrock Park, Wits University. Wits alumni, bursary fund trustees such as the Skye Foundation’s Jeff Fisher, and Wits management represented by the Dean of Students, Prem Coopoo and the University’s Registrar, Kirti Menon, were among the guests invited to present recipients their bursaries. Altogether 106 bursaries were awarded and are spread over 23 sporting codes, ranging from athletics to adaptive rowing for physically challenged persons. The 34 rugby club members who received bursaries constitute the single largest category of sports bursary holders, while netballer Ofentse Morapa is the sole bursary recipient in her code. 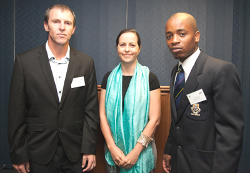 The function was addressed by Clare-Anne Kilroe, Wits lecturer and alumnus and a practicing physiotherapist. Kilroe’s presentation dealt with the importance of professionally managing sports-related injuries for optimal sport performance over the competitive lifetime of sportsmen and women. An approach such as this is multi-disciplinary combining medicine, physiotherapy, nutritional science and sport psychology. Wits Sports’ Acting Director of Sport Marius Henn reminded students and bursary foundation trustees of the importance of tertiary-level sport for achievement at the highest level. “The continued high contribution of sportsmen and women in the United States, Australia and the UK to their countries’ medal tallies is as a result of their college sport systems. A significant proportion of those countries’ Olympic squad members are drawn from the ranks of college students,” he said. Wits Sport, and its sportsmen and women, continue to enjoy the confidence of patrons in the sporting community, including the Skye Foundation which is supporting ten rugby, hockey and athletics students this year.